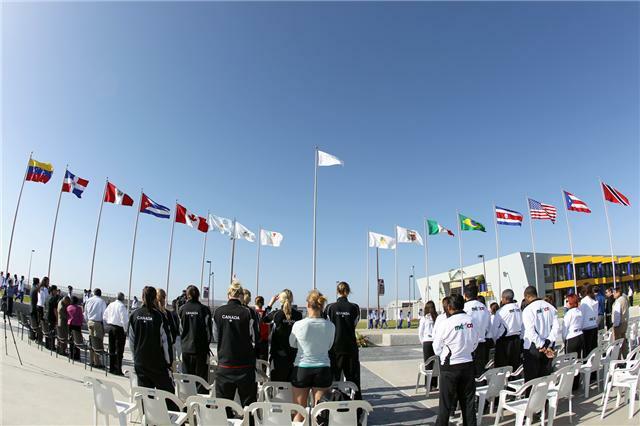 TIJUANA, Baja California, June 16, 2010 – The first official ceremony of the Ninth Women’s Pan American Cup was held on Wednesday with the Rising of Flags at the Circle Plaza of Baja California High Development Centre. The ceremony was presided over by Mr. Saul Castro Verdugo, President of the Organizing Committee and Mr. Ismael Acosta, President of Mexican Volleyball Federation. Both addressed the people in attendance that included the delegations of Canada and hosts Mexico. Previously, the members of the Control Committee, led by Dr. Rafael Lloreda Currea of Colombia, made the preliminary inspection to the playing venue facilities in Tijuana and Rosarito. Eleven teams (with the withdrawal of Venezuela) will take part in this qualifier to next year’s FIVB World Grand Prix. Teams competing in Pool A are Argentina, Brazil, Canada, Cuba and Dominican Republic while Pool B consists of Costa Rica, Mexico, Peru, Puerto Rico, Trinidad & Tobago and USA. The General Technical Meeting is to take place on Thursday at 20:00 hours preceded by the Head Coaches’ Press Conference at Tijuana Grand Hotel.